The recent news reports that Evgeniya Chirikova, a leading Russian environmentalist, had moved to Estonia with her family brought back vivid memories of helping an internationally renowned photographer take portraits of her and a group of her fellow activists in the Khimki Forest, just outside Moscow. It was 2011, and their struggle to protect the last old-growth oak forest in the Moscow region from a major highway construction project had become emblematic of civic activism in Russia. Chirikova herself, despite having suffered physical attacks and vicious harassment by anonymous thugs and local police, was bubbly, fired up with enthusiasm and hope. Leaving her forest and her country just wasn't in the picture. Four years later, she explained her departure by citing growing concern for the safety of her two children. 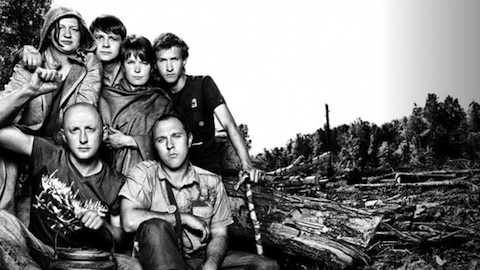 With a twinge of nostalgia, I looked up this photograph -- only to realize that of the six activists profiled in it Chirikova was not the first to leave Russia. A young man in the forefront of the photo, Suren Gazaryan, also a prominent Russian environmentalist, went into hiding and left the country in December 2012. The authorities had brought new criminal charges against him, less than six months after he and a colleague, Evgeny Vitishko, were convicted of causing criminal damage to a fence in a flawed, politically motivated trial. When Human Rights Watch photographed Chirikova and Gazaryan toward the end of Dmitry Medvedev's quasi-liberal interregnum as Russia's president, they were among the many Russian activists we celebrated as part of our “Acting Up” multi-media feature. At the time, with the voice of discontent rising in Russia, many feared that Vladimir Putin's imminent return to the Kremlin would bring about a tightening of screws. But Russia's civil society was vibrant, fast-growing, and inspiring tremendous hope for reform. We could not anticipate the magnitude of the crackdown that Putin would unleash once back as president -- a sweeping Soviet-style crackdown aimed to stifle free expression and independent activity. I click on “view all” photographs and gaze at the faces of Russian civil society caught by the camera when there was still air to breathe and space to act. Artemy Troitsky, a flamboyant rock critic and civic activist, told the press last summer he was moving to Tallinn, because the “ambience of hysteria, militarism, and aggression” left him no other choice. A young woman in Islamic dress holding a newspaper -- that's Nadira Isaeva, former editor of a prominent independent weekly in Dagestan, a turbulent region in the North Caucasus currently known as Russia's hot stop number one. She fled Russia less than a year after that photo was taken for fear of politically motivated prosecution. Another young woman, smiling with dark curly hair, a well-known anti-fascist activist and a frequent participant in protest rallies -- that's Yulia Bashinova, who left Russia with her husband and three kids last year. Like Chirikova, she was concerned for her family's safety. Here is a bright young man who was deputy-head of Transparency International in Russia -- Ivan Ninenko. The organization was recently branded by Russia's Justice Ministry as a “foreign agent” -- an ugly term that in the Russian language can be only interpreted as “spy” or “traitor” -- under a law aimed at discrediting and demonizing independent rights groups. Ninenko is now teaching, far away from Russia. These and many other amazing people left the country over these past two years, as the environment has grown increasing more suffocating and hostile. I stare at my own photo -- the last one in the spread -- and try to count how many friends and colleagues have left Russia already. I stop counting when I run out of fingers on both hands. Some left because they could no longer do their work. Some feared for their lives or the lives of their loved ones. This exodus is a loss for Russia. These people were in fact Russia's future, the future stolen from the Russian society by the powers that be. Tanya Lokshina is Russia program director at Human Rights Watch. Article: "Russia's Stolen Future is republished with permission of Foreign Policy in Focus"